from 11:00am-4:00pm at the winery. 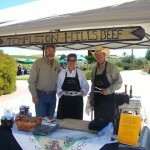 Meet the owners, taste and learn about natural grass fed beef. Victor Hugo 2011 Estate Petite Sirah wins a double gold medal at the 2014 San Francisco Chronicle International Wine Competition. 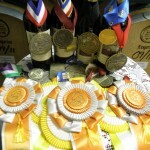 Over 1,500 wineries competed in the competition with 5,825 entries. Zinfandel Wine Specials, cheese appetizers, barrel samples all weekend!! Taste and learn about the various olive oils, how to use olive oil in cooking & specials on Olea Farms olive oil all weekend! The 2010 Estate Zinfandel wins double gold at the 2012 Grand Harvest Wine Competition. This limited production wine continues to medal in all wine competitions it enters. Available in limited supply at the winery for club members. Victor Hugo winery hand-harvested their Estate Viognier on 9/14/12. The 2012 vintage promises to be the best in years. Small clusters and perfect ripening weather provide aromatic flavors from the free run juice samples. New Hungarian, French, and American oak barrels arrive tomorrow for aging the 2012 Victor Hugo wines.